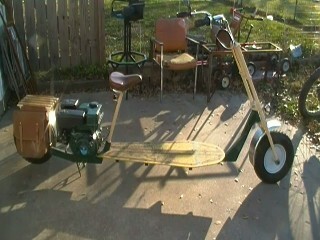 The "Turf Surfer" a Home Made Scooter: I've been riding for for 35 years give or take a few. A year or so ago I decided I wanted to build a new toy. I wanted a mini bike, or a trike & was drawn toward building one of these. After all, it was just for my amusement. I was doodling in my spare time one day and did a quick sketch that really caught my eye & I was intrigued! So off to the drawing board, and the shop. This is what I came up with. man is it a hoot. I get smiles and waves from everybody I see when I'm putting around. Yep, those are wheel barrow wheels! I was looking for tips on frame building, as I'm about to begin a new project, when I came upon "Custom Choppers Guide" on Youtube. I also have a channel with the complete build on it. Thanx guys! Your site is awesome. Remember, We're all in this together & none of us are getting out alive! So enjoy your self now, while we can! I like it, a lot !